On this edition of No Holds Barred, host Eddie Goldman pays tribute to boxing legend Emile Griffith, who just passed away at age 75. Upon hearing of his passing, our correspondent Charles Farrell wrote of Emile Griffith that he was a "spectacularly good fighter. His fights with Luis Rodriguez are works of art. Those two were as close to being equals as any two fighters I've ever seen." Those fights can now be seen on YouTube. Back in October 2008, there was a media event in Manhattan for the publication of the book "Nine ... Ten ... And Out! The Two Worlds of Emile Griffith". 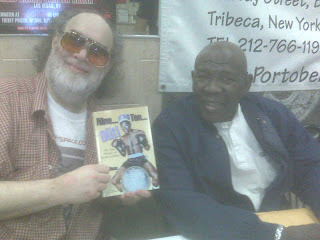 This book was written by Ron Ross and published by boxing promoter Lou DiBella. We spoke with both of them at that event, and are reposting these interviews, which originally appeared on the now-defunct SecondsOut Radio, in their entirety. We spoke at length with the author of this book, Ron Ross, and its publisher, boxing promoter Lou DiBella, about the significance of this story about Emile Griffith, who had a Hall of Fame career in the 1960's and '70's as a welterweight and middleweight champion of the world many times over. But this book, and our discussion, also delved into that second, less public world lived in by Emile Griffith, that of a gay man. In our conversations, we all emphasized the importance of promoting tolerance, even in this brutal world of boxing. ONE Fighting Championship. ONE FC is Asia's largest and most prestigious mixed martial arts event. ONE FC features the best Asian fighters and has initiated the ONE Asia Partnership Network, which includes most of the major MMA promotions and MMA gyms in Asia. For more information, go to their web site, at ONEFC.com. The First Annual Liberty Bell Classic East Coast King of Catch Tournament, organized by the North American Catch Wrestling Association in conjunction with Scientific Wrestling. This catch wrestling tournament will take place Saturday, August 31, 2013, at the Klein JCC, 10100 Jamison Ave., Philadelphia, Pennsylvania 19116. No points! No politics! Only submissions and pins win! For more information, go to http://nacwa.weebly.com.